The Macro palette enables you to record and play back macros. Macros are a way to record sequences of actions that you use frequently. You can then play the macro any time by pressing the button. Macro buttons can have hotkeys assigned to them. You can also move them to a convenient part of the interface if you decide to customize your UI. See the section on Customizing the Interface for more information. Macros are composed of Zscript, the ZBrush scripting language. It is possible to edit macros in a text editor to extend their functionality. Starts the recording of a macro. Once recording has been started, all actions will be recorded until End Macro is pressed, at which time you’ll be prompted to save the macro to a file. Stops recording a macro, and prompts you to save the recorded commands to a file. The saved macro will immediately be available in the Macro menu. The button will have the same name as the file name you used. Make sure to save the macro inside a sub-folder of the ZStartup/Macros folder. Choose the Misc sub-folder or create a new sub-folder of your own. It is essential to save to a sub-folder – macros saved directly to the ZStartup/Macros folder will not appear. The Macro may not show right away. 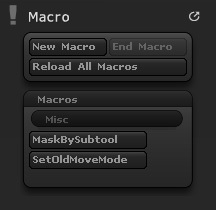 Press Reload All Macros to refresh the Macro Palette. Reloads all macros from their text files. This can be used to force reloading of macros that have been edited in an external text editor.